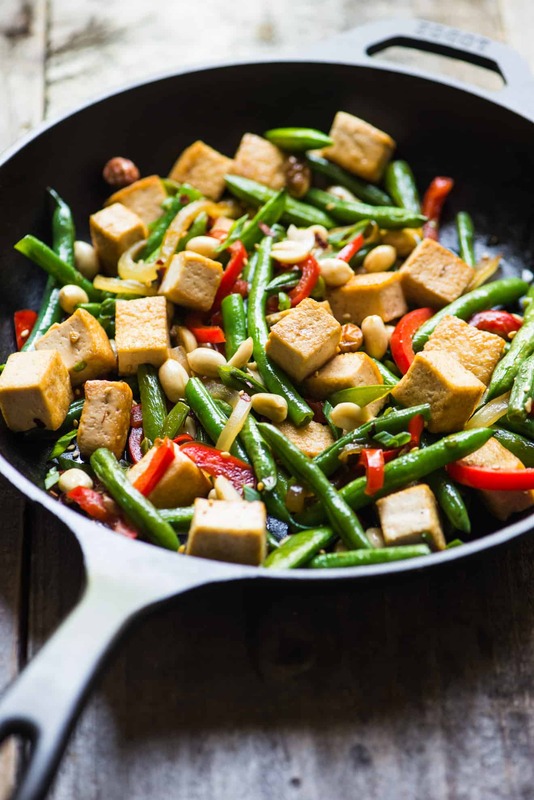 This spicy kung pao tofu stir fry is an easy dish that takes only 30 minutes to make! It’s filled with green beans, sugar snap peas, peppers and crunchy peanuts. Well, imagine my surprise when I saw kung pao chicken (宫保鸡丁, pronounced gong bao ji ding) on the menu in China. As it turns out, kung pao chicken is a Sichuanese. It’s usually made with a combination of chicken, vegetables and peanuts and a generous helping of spice (chili peppers and Sichuan peppercorns). The best part about the dish, though, is not the chicken. Oh no, it’s all about the peanuts. 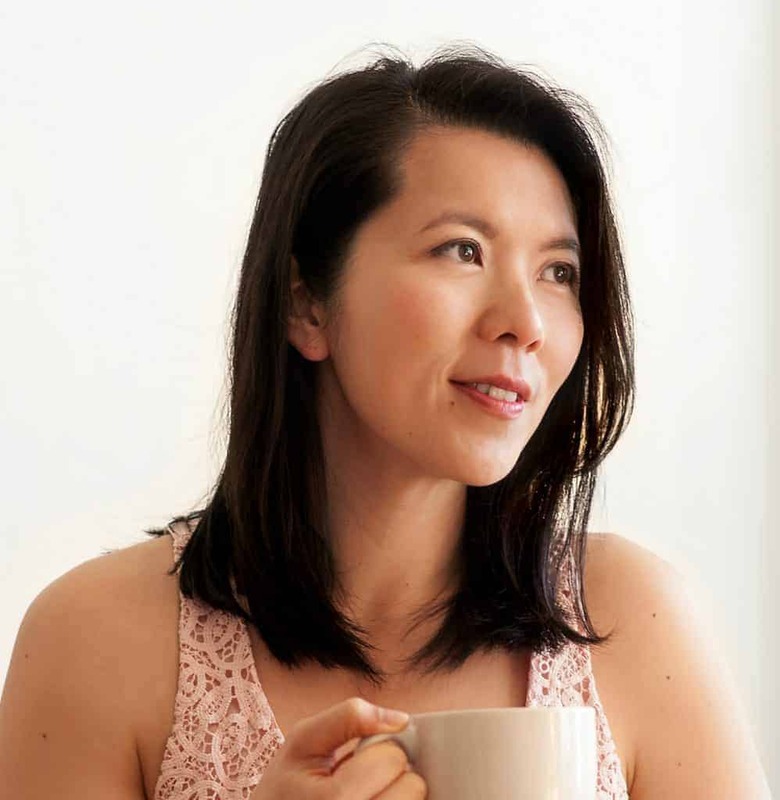 I still reminisce about those days in China, where I would sit around the dinner table and chat with my friends, picking off individual peanuts with my chopsticks and whiling away the time. Life operated at a much slower pace when I lived there . . .
Stir frying peanuts with vegetables sounds like something that shouldn’t work, but it does. I absolutely love the crunch of the peanuts. In this vegetarian version, I’m substituting the chicken for pan-fried tofu. 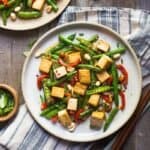 This kung pao tofu stir fry takes only 30 minutes to make and it’s great with a side of rice or whatever grains you have on hand! 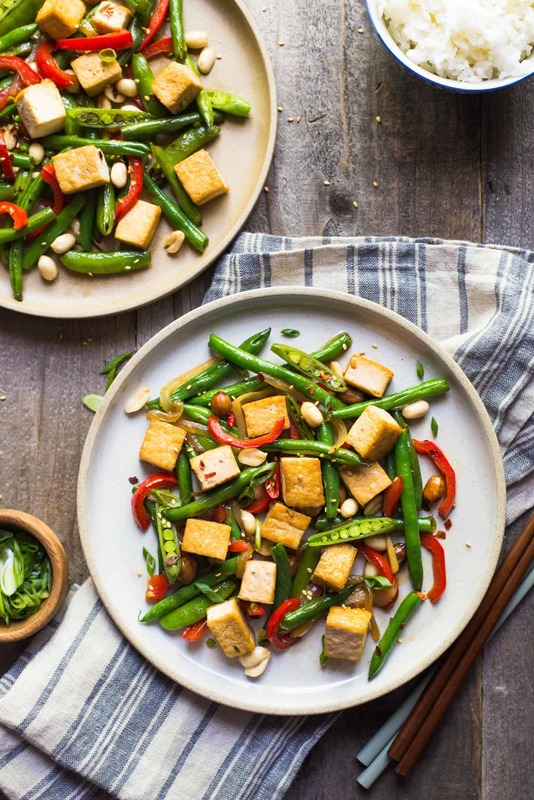 Tips for stir frying tofu: In the instructions for the recipe, I pan fry the tofu separately before cooking the vegetables. This gives the tofu a nice sear on the sides and allows the tofu to pick up more sauce. 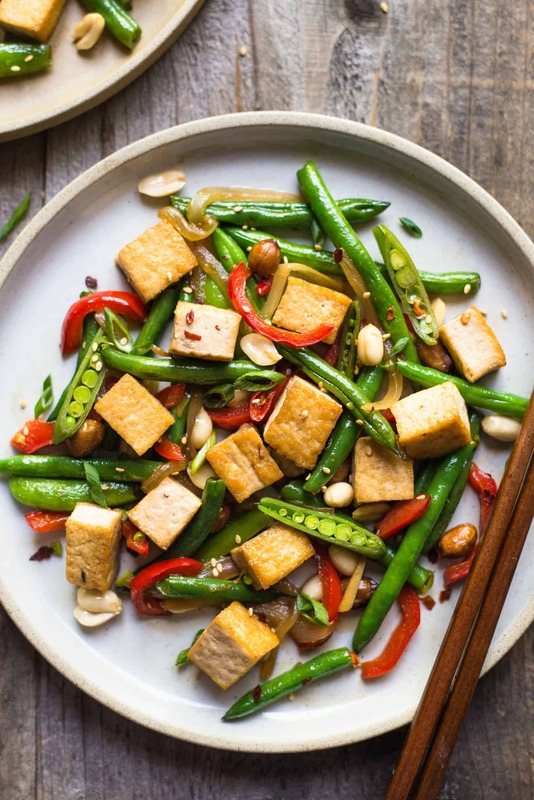 If you skip the pan-frying step and cook the tofu and vegetables together, the dish will become more soggy. Using raw peanuts: For the photos, I’m using raw peanuts (shelled peanuts with their papery skin still in tact) that I roasted at 200ºF (95ºC) for 1 hour. After roasting them, I gently rubbed the papery skin off of some of the peanuts. You don’t have to use raw peanuts—roasted, unsalted peanuts work just fine. I just happen to have several pounds of raw peanuts sitting in my pantry that needed to be used. 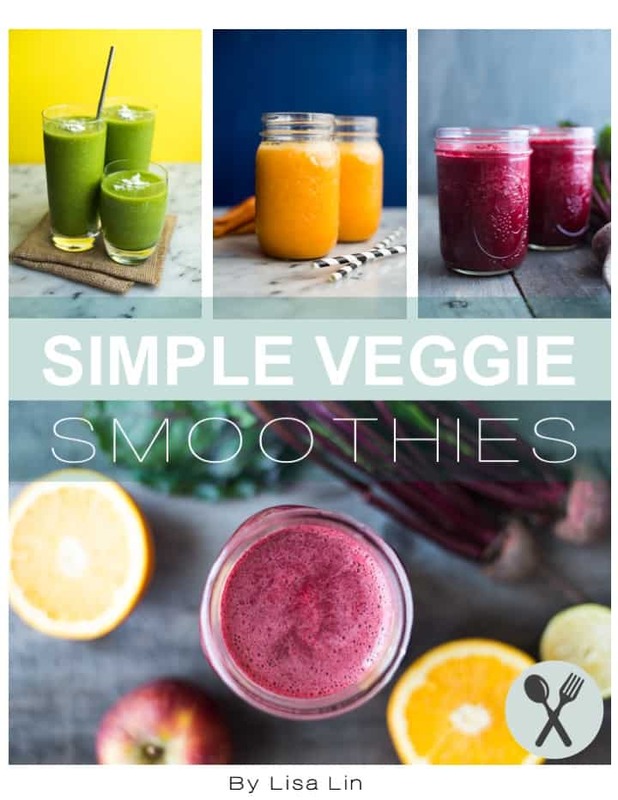 This recipe works well with other vegetables, such as carrots, zucchini and cabbage. Take the tofu out of the package and wrap it around a layer of paper towels. Let it sit on the counter for 10 to 15 minutes. Then, cut the tofu into cubes. In a small bowl, mix the soy sauce (or tamari), honey, water and cornstarch. Set that aside. Heat 1 1/2 tablespoons of oil in a large sauté pan or a wok over medium-high heat. Add the tofu cubes and fry them for 5 to 6 minutes, flipping them occasionally to sear the other sides. Sprinkle a pinch of salt over the tofu. Transfer the tofu to a plate and set that aside. Add the remaining 1 1/2 tablespoons of oil into the pan and add the onions. Let the onions cook for 2 minutes, then add the ginger and chilis and cook until fragrant, about 30 seconds to a minute. Mix in the green beans, sugar snap peas, bell pepper and a pinch of salt, and cook for 4 to 5 minutes. Add the fried tofu and peanuts and stir to combine. Give the soy sauce mixture a quick stir and pour it into the pan. Let the sauce thicken for 30 seconds and stir to coat the vegetables and tofu. Add the sliced scallions and stir to incorporate. Season with more salt to taste and garnish with red pepper flakes, if you like.